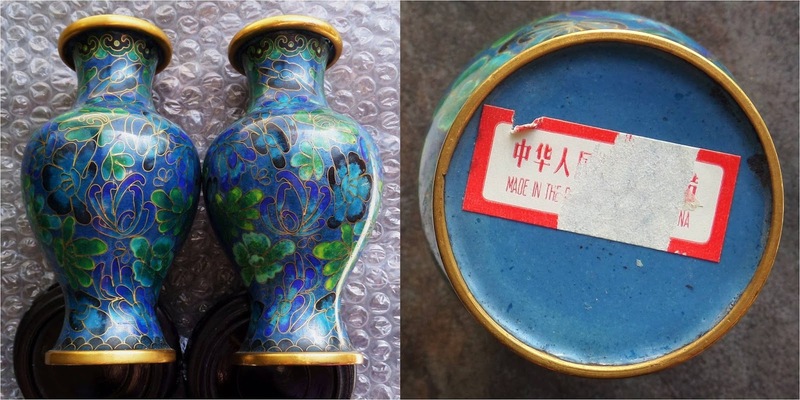 Beadiste: Puzzling Evidence - Monochrome Chinese Cloisonne Beads, Deco or Seventies? 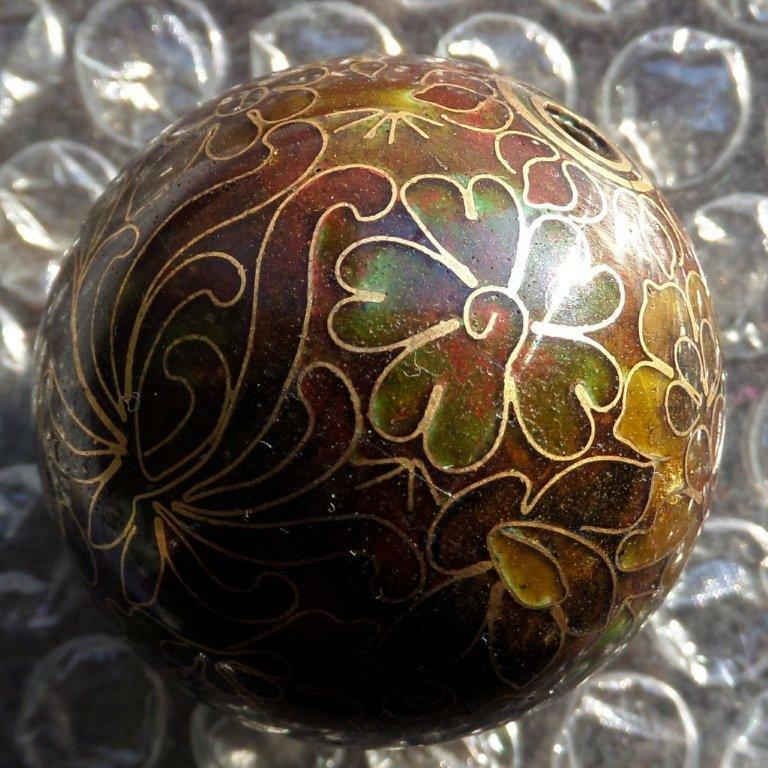 Puzzling Evidence - Monochrome Chinese Cloisonne Beads, Deco or Seventies? 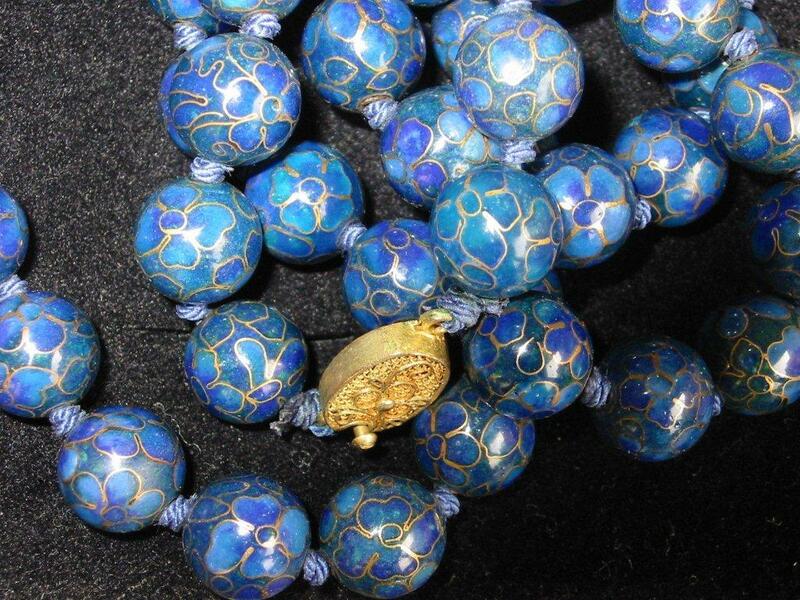 Appearing occasionally in online auctions are necklaces of Chinese cloisonné beads with blue monochrome enamel, sometimes splashed with green. 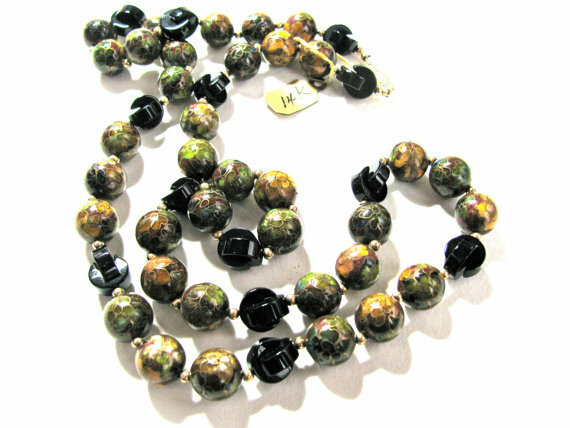 A Deco era origin date is often asserted; but, are these beads actually from the 1920s-1940s? 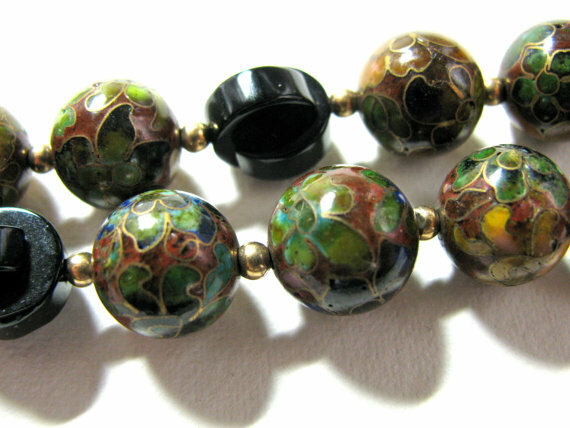 Evidence from other cloisonné styles indicates that such dating is off by about half a century – these beads were most likely made some time around the 1970s. 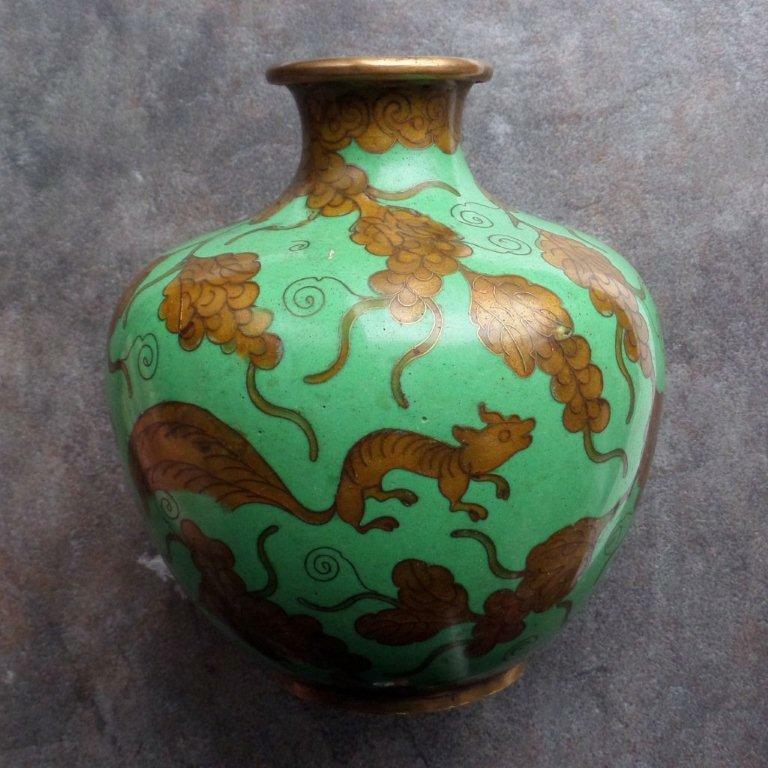 Actual Deco Chinese cloisonné pieces with a monochrome appearance, such as bowls, jars, and vases with an overall floral pattern, are made in a peculiar style: a base of the usual range of opaque enamels with a secondary layer of transparent amber, giving an overall brownish tint. Photos courtesy of eBay vendor van29900. 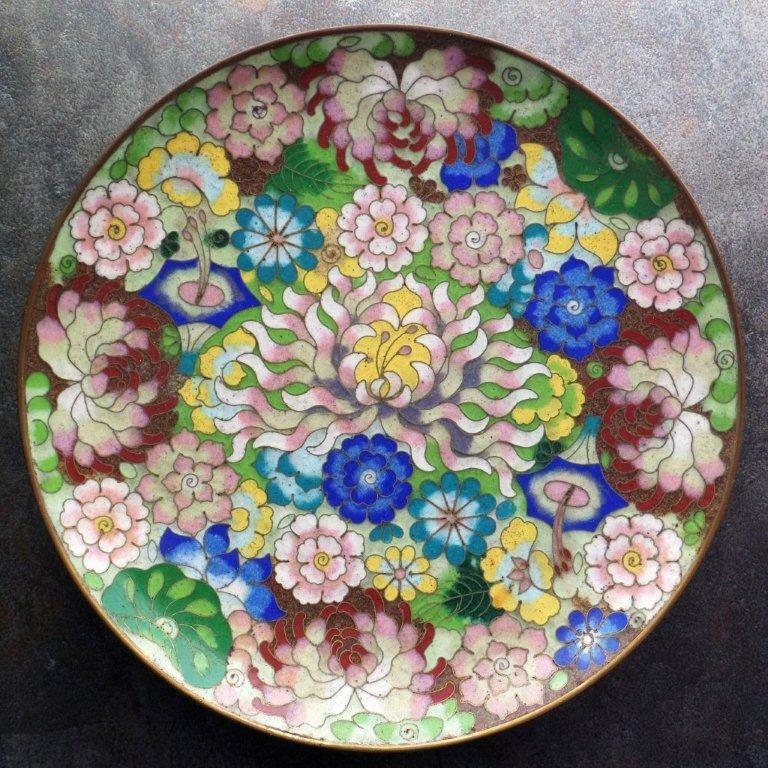 What the flowers beneath the amber enamel might look like without the overglaze. Vases and bowls from the 1930s and 40s with borders of ruyi and rocks/plant shoots also frequently get this treatment, as do the "woody" stems of blossom branches. Rim and foot from a vase purchased in China in the 1940s. 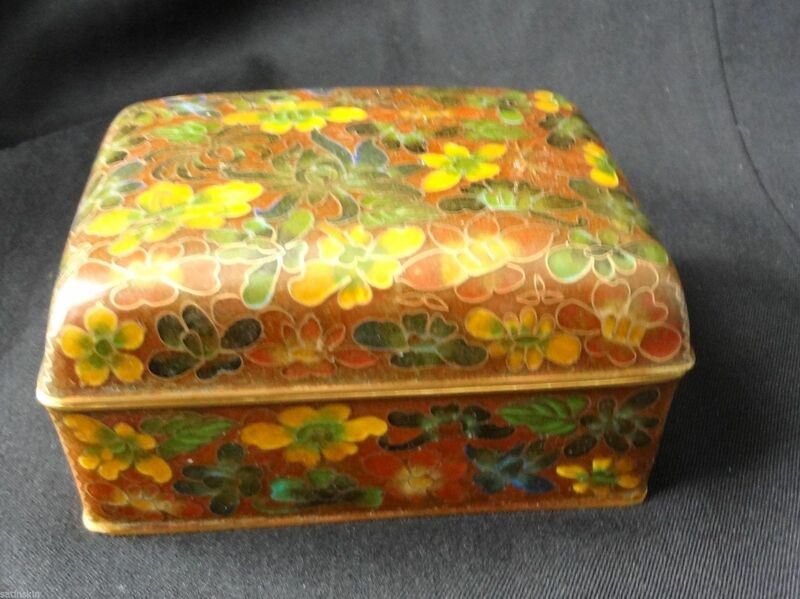 This light amber seems to be the only transparent enamel used in Chinese cloisonné before the 1960s. Squirrel and grapes motif, background metal can be seen through the transparent amber enamel. The CHINA base stamp makes a pre-1950 date likely. 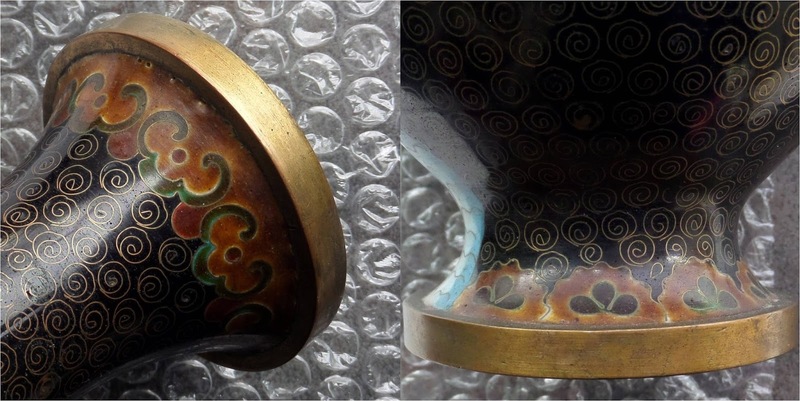 As evidenced by this ashtray, a new method of monochrome cloisonné work was employed during the 1970s, certainly by the JingFa factory. eBay vendor powderguy1960 says he purchased this in Hong Kong in 1973. Matched boxed set sold by Lillian Vernon. Note typical JingFa reversed symmetry in exactly matching pattern on each vase. Blue and brown seem most common, with green, red, and purple also showing up in online auctions. Close examination reveals a skilled pointillist combination of black, white, and colored enamel grains to achieve a blended ombre effect. Monochrome beads examined closely display this same mixing of granular enamel particles. The amber overglaze continued to be used. Large JingFa-style bead, measures 35mm. 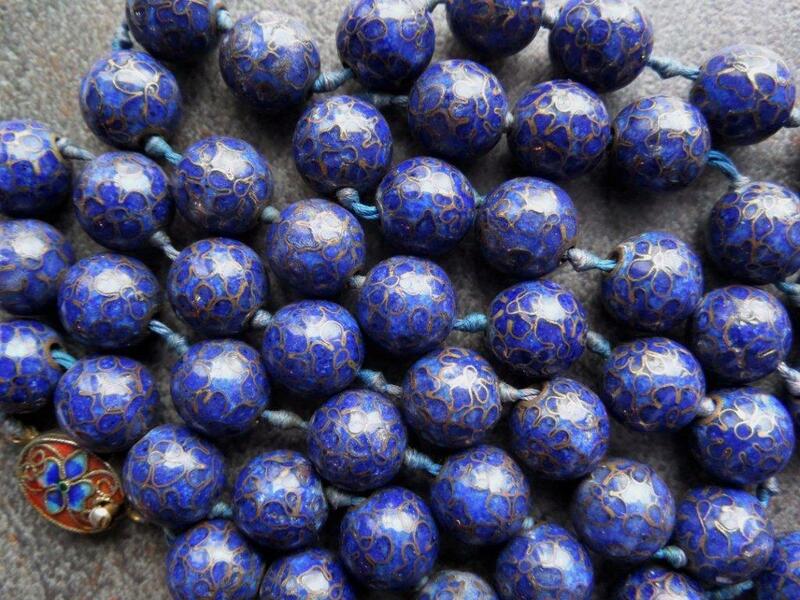 Similar large beads can be seen used as lamp finials. 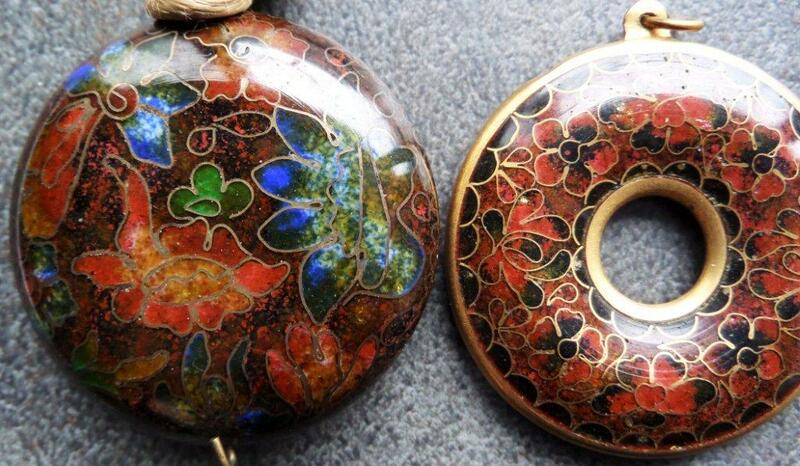 Seller of pendant on the left stated, "I found this in Beijing a the finest cloisonne manufacturer when I visited China in 1996. 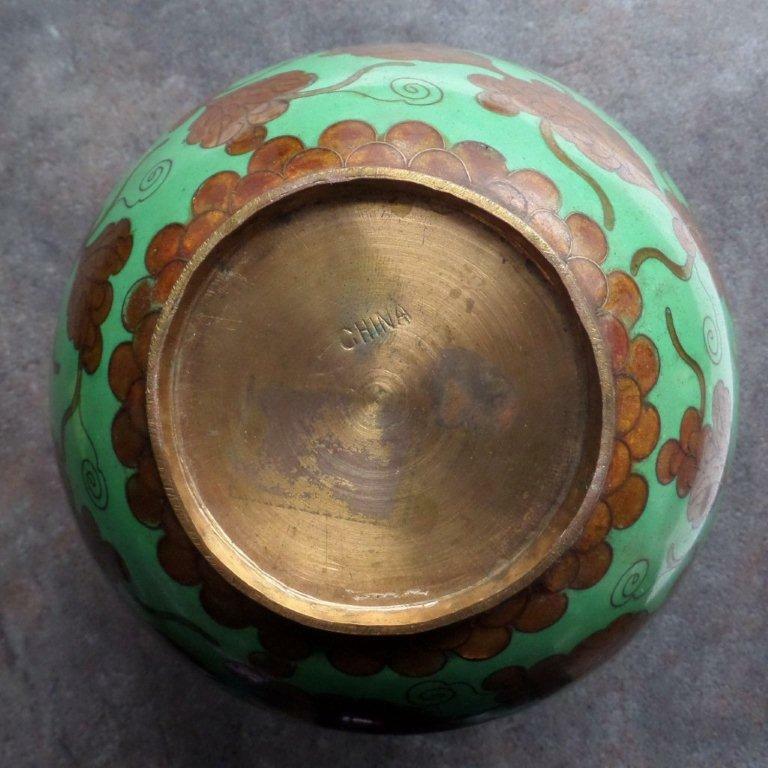 It comes from the Beijing Enamel Factory in Chongwen District." Evidence thus seems to make a 1970s or later attribution for this type of bead more likely than the Art Deco era. 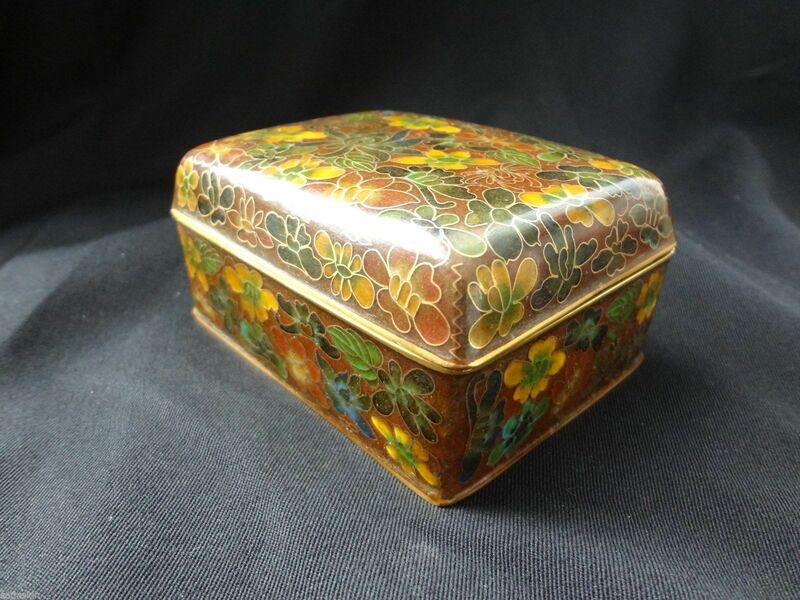 UPDATE: eBay vendor satinskin gave permission to post these pics of a box with the amber monochrome overglaze that was "purchased between 1960-1970 and has never been used." 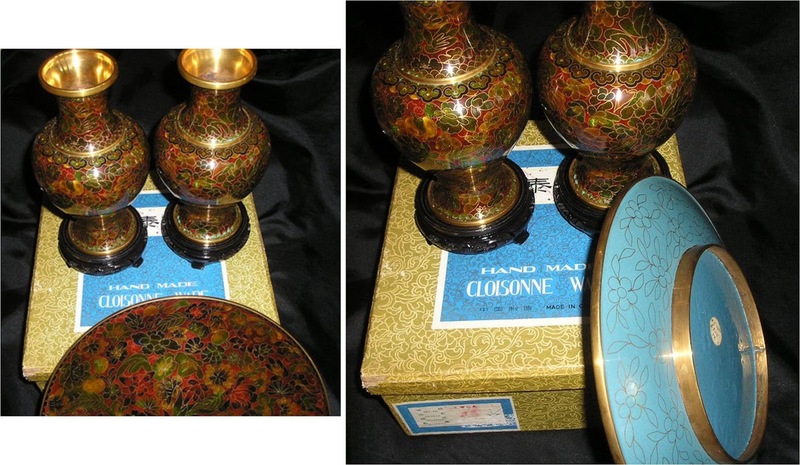 It shows excellent examples of the type of standardized floral patterns used after the JingFa cloisonne manufacturing cooperative was organized in 1956. 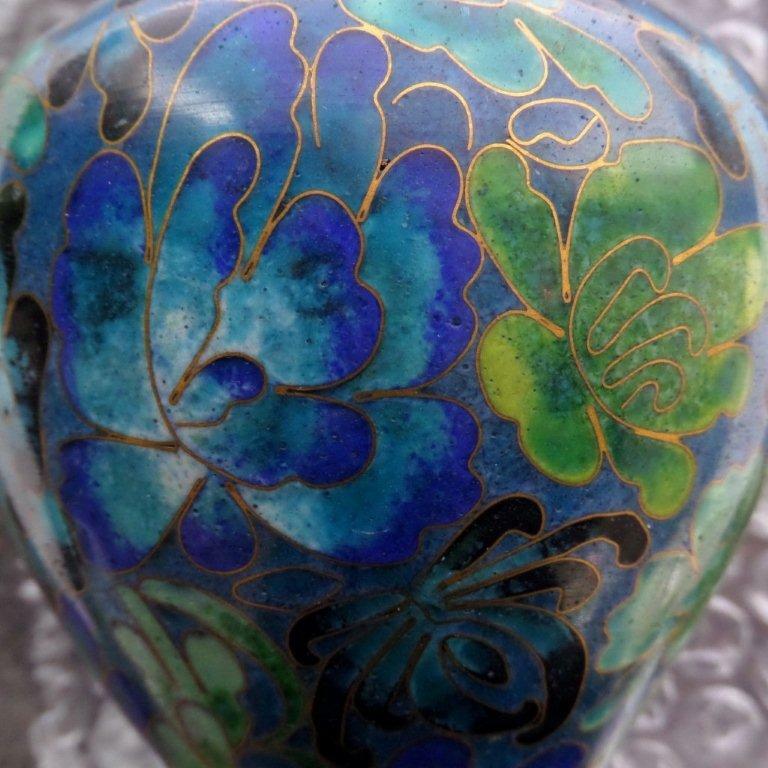 Certain Chinese cloisonne beads also display these floral patterns in miniature, the subject of an upcoming post. Comparing these box pictures with the pictures of my ginger jars above, what do you think of these beads, which were sold as a Deco-era (1920s-40s) necklace? "The cloisonne beads in this necklace are from the 70's." 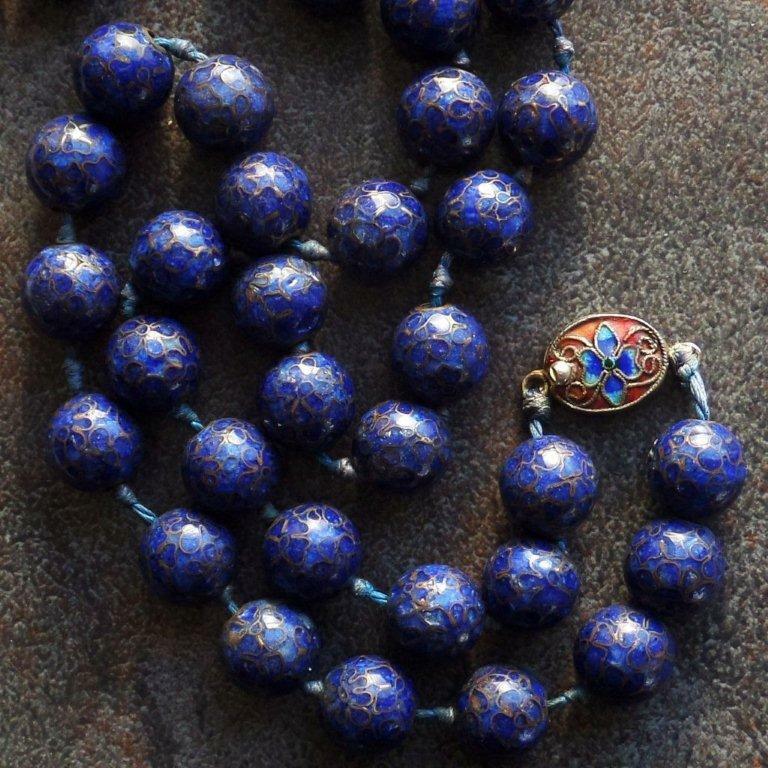 UPDATE: eBay vendor eclectomania states that this blue necklace was "purchased at a state-owned Friendship Store in Shanghai, China in 1983."